Just a girl with a hammer: If you are a house blogger . . . I guess I'm exempt because I'm more of a garden blogger...right? ugh...we really need to finish our kitchen someday...our floor is so nasty. I have also noticed this kitchen reno/procreation trend! The door looks so much better! I have a fear of yellow doors. Mine only looks good in the dark. 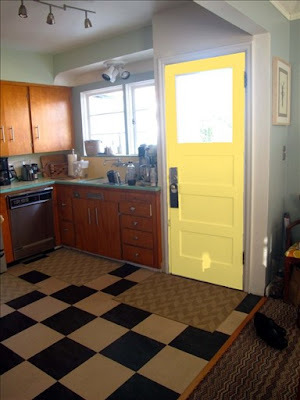 I'm not into the yellow door. Would it look weird if it matched the soffit? I do tend to stick with classics for doors, though, so I'd probably go with white. Over the last two years I've noticed the majority of my favorite home remodel/decor bloggers have gotten knocked up and I've gone from reading about stuff that interests me to nurseries and morning sickness. I've unsubscribed a lot. I'm sure they don't miss me since I have nothing to add to the discussion about whether this pink is better than that pink for crib bedding. I've seen yellow doors in person that look great, but they can look strange online. Maybe more of a goldenrod color instead of the pale, traditional yellows above?